VoiD is an SSBU Pichu player with strong secondaries like Wolf, Roy, Daisy and Peach from Kapolei, Hawaii, who is currently residing in Los Angeles, California. He is considered the best Pichu player and one of the best Wolf players in the world. In Smash 4, VoiD was a Sheik main and was considered the best Sheik player in the world. He was also considered the best Zero Suit Samus player in SoCal and one of the best Fox players in SoCal. He was a major pioneer and influence on the Sheik metagame, notable for his usage of innovative combos, extensions, and kill set-ups. VoiD is currently ranked 2nd on the SoCal All-Time Smash 4 Power Rankings, 11th on the Panda Global Rankings 100, and was formerly ranked 1st on the Hawaii Power Rankings. He regularly teams with NAKAT in Doubles, and the pair are considered one of the best Doubles teams in the world. On January 5th, 2016, VoiD was signed by 2GGaming. On June 16th, VoiD was signed by Counter Logic Gaming. VoiD, along with Nairo and D1, was featured on Road to EVO: Nintendo Minute. 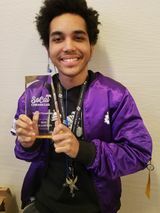 VoiD is an accomplished Dragon Ball FighterZ player, placing 49th out of 2,579 entrants at EVO 2018. VoiD is currently ranked on "Shenron's Snubs", the equivalent of Area 51 on the Panda Global Rankings Z. VoiD is the first and currently only Sheik main to have won a major tournament since the character got nerfed in patch 1.1.5, doing so at Smash 'N' Splash 4. This page was last edited on April 24, 2019, at 18:36.